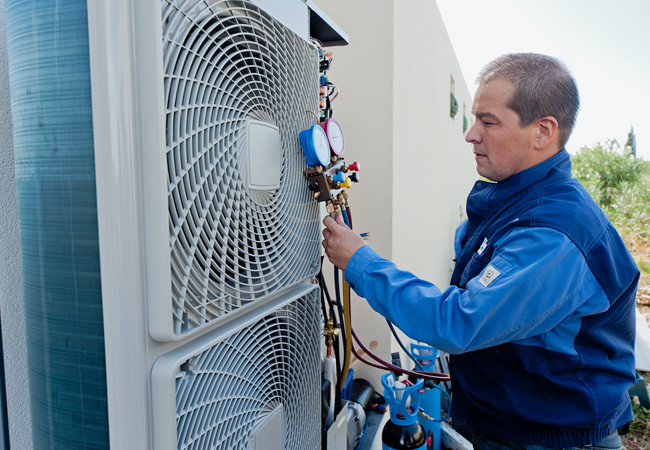 With an increasing interest in the use of refrigerants with a low global warming potential (GWP), engineers are looking to nature’s refrigerant – R-718, better known by its chemical formula, H2O. Evaporative cooling is not a new concept; its use in buildings can be traced back thousands of years. However, renewed interest is spurring innovation in evaporative-cooling technologies. This article will discuss some of these and their applications, with a focus on direct and indirect evaporative cooling. The effectiveness of evaporative cooling is largely dependent on the climate in which it is being considered. Hot, arid climates are the obvious choice for its use, whereas humid climates will limit its effectiveness. In favourably mild climates, evaporative-cooling technologies have the potential to replace vapour-compression cooling systems. However, for most suitable climates it will need to be supplemented with some form of mechanical cooling. 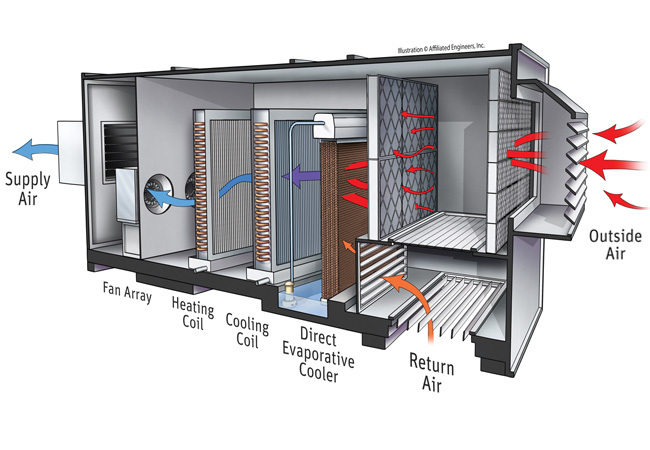 Direct evaporative cooling (DEC) – the process of adding moisture directly to an airstream and allowing the latent heat of evaporation to cool the air – is typically achieved using a wetted medium installed in an air handling unit. This method is generally preferred to spraying water into the airstream. The process follows the constant wet-bulb line towards saturation, while the dry-bulb temperature decreases. The effectiveness of evaporative media, often referred to as the saturation efficiency, determines how close to saturation the air becomes. Saturation efficiency, defined by the equation on the left, is a function of the media depth and the air velocity through the media. 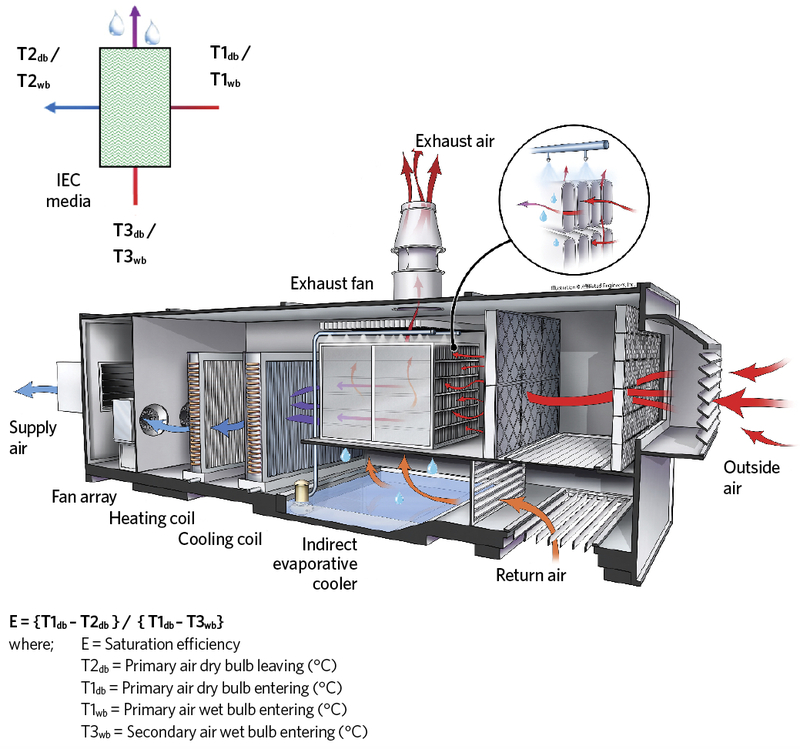 Indirect evaporative cooling (IEC) relies on a secondary airstream, in which the evaporative cooling process takes place and sensibly cools the primary airstream via a heat exchanger. The secondary airstream can be exhaust/return air from the building, or ‘scavenger’ air from outside. The advantage of indirect over direct evaporative cooling is that no moisture is added to the primary airstream. 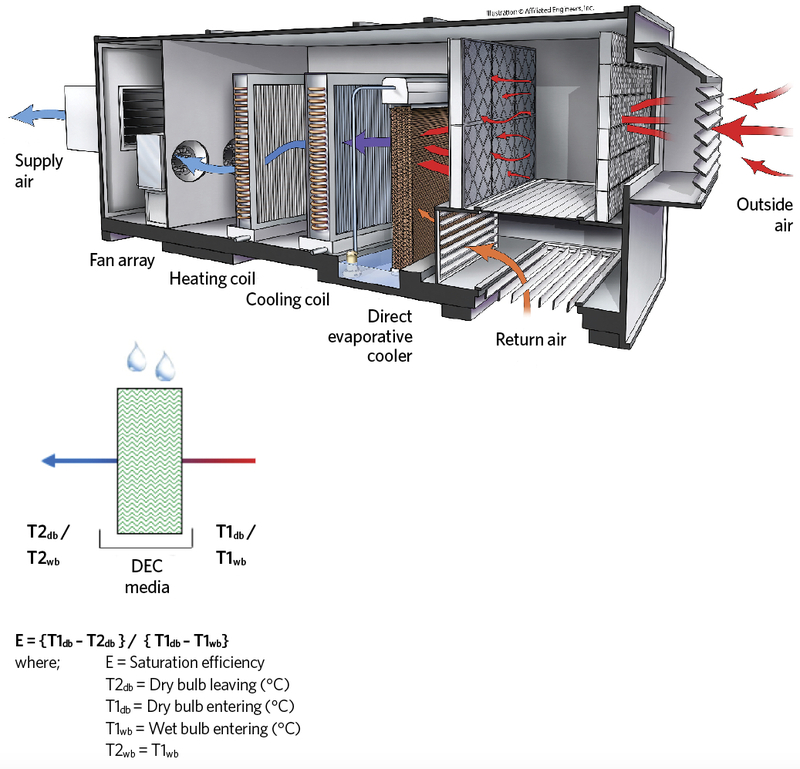 The disadvantage is that it is less efficient at cooling because of the added heat-exchange process between the primary and secondary airstreams. Indirect evaporative cooling is more suited to building types where humidity control is required – for example, a laboratory. 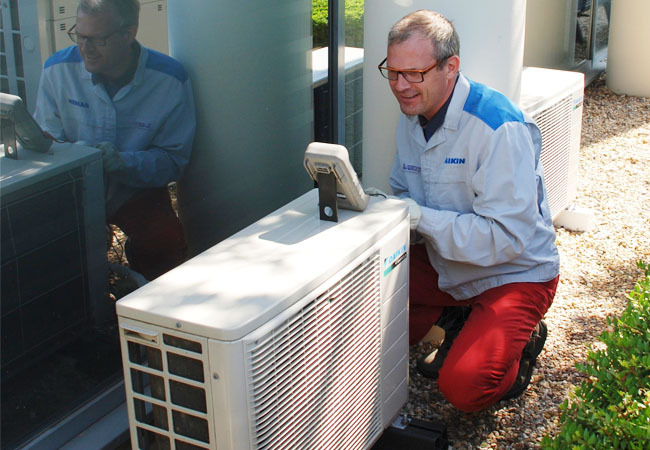 Both systems (direct or indirect) or a combination of the two (indirect/direct) offer significant potential in the right climate to save cooling energy. 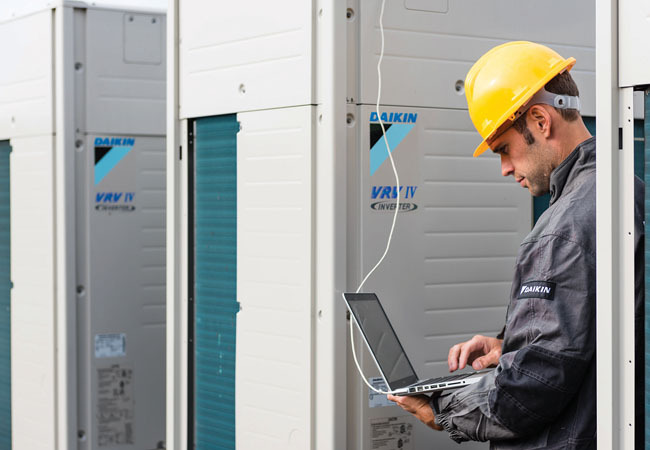 Energy savings are achieved either by eliminating the need for mechanical cooling, or by extending the range of economiser hours – to reduce chiller operating hours – and reducing the mechanical cooling load. Parasitic energy losses need to be accounted for when designing and optimising evaporative cooling systems. These losses take the form of additional fan power associated with pressure loss across the evaporative media. 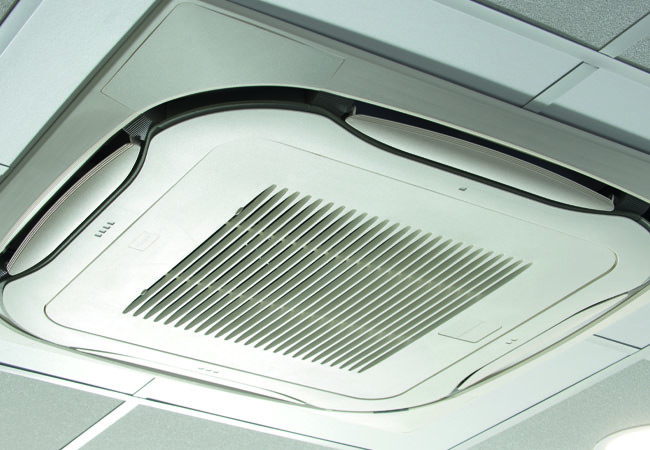 For an indirect evaporative cooling system, this includes additional fan power required at the supply and exhaust/scavenger fans. 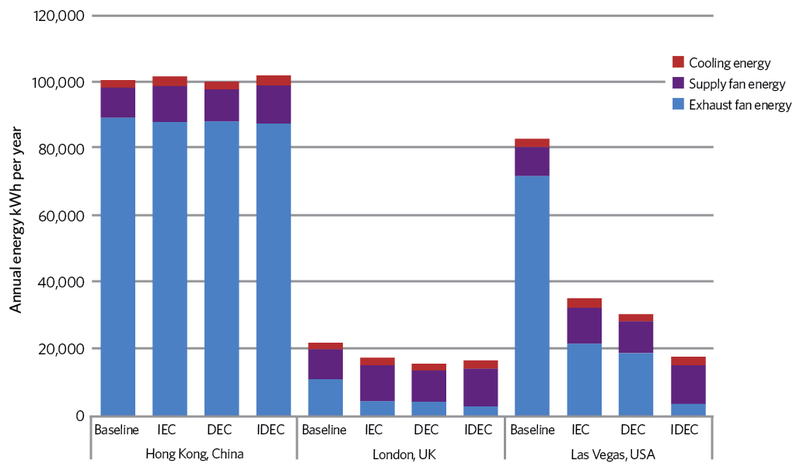 The case for evaporative cooling has been evaluated for direct, indirect and indirect/direct technologies in three distinctly different climates – London, Las Vegas and Hong Kong . The analysis assumes an office building with a typical occupancy profile and a central variable air volume (VAV) system to condition the building. Additional fan power (parasitic losses) are accounted for in the analysis. Reviewing the weather data for each location is insightful in predicting how effectively evaporative cooling will perform in each climate. 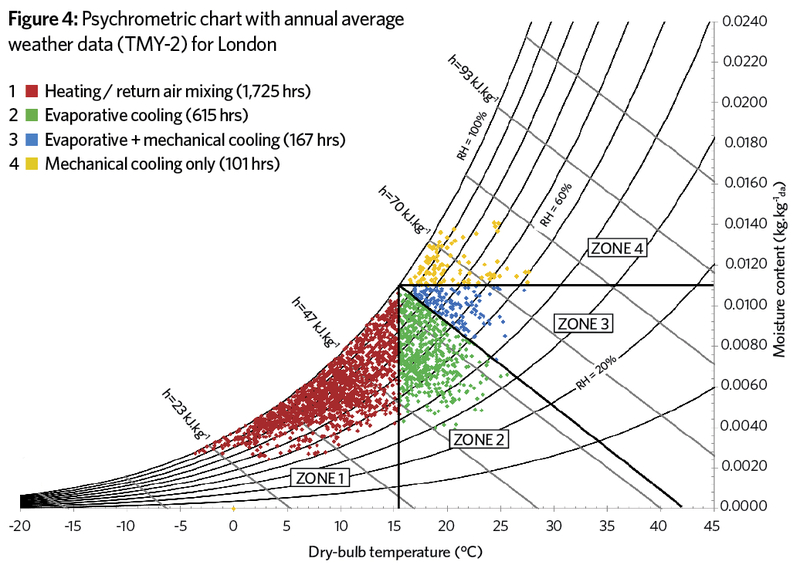 A psychrometric chart identifying ambient design conditions during operational hours throughout an average year (TMY-2 data) is an ideal visualisation tool. Design conditions falling within Zone 2 on the chart are ideal for evaporative cooling, with conditions in Zone 3 also suitable for supplemental cooling. Zone 4 represents conditions that sit above the dew point corresponding to the supply air temperature and render evaporative cooling ineffective. 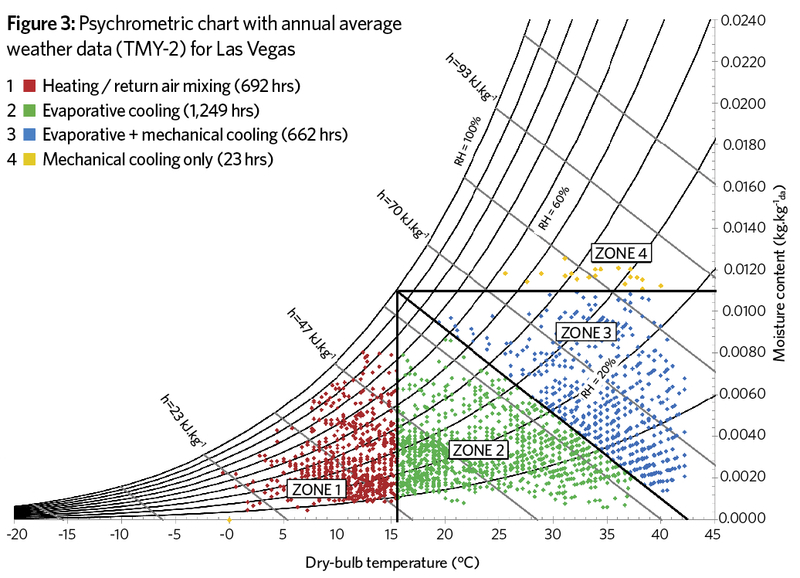 The psychrometric weather data chart for Las Vegas (Figure 3) shows a significant number of hours suited to evaporative cooling (Zones 2 and 3). There are only a handful of hours when evaporative cooling would be ineffective (Zone 4). Weather data for London in Figure 4 demonstrate some clear opportunities for evaporative cooling (Zones 2 and 3) with only a small proportion of hours in Zone 4. 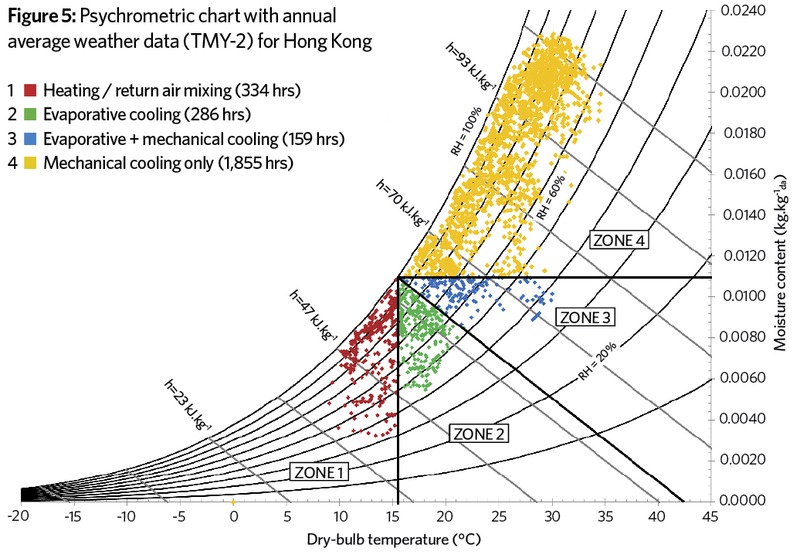 As Figure 5 shows, Hong Kong is synonymous with a hot and humid climate. Significant hours of weather data reside in Zone 4, where evaporative cooling is ineffective. We can infer that evaporative cooling is likely to have very little effect in this climate. The results for the energy study are summarised in the chart (Figure 6) and align with expectations. In Hong Kong, direct, indirect and indirect/direct evaporative cooling systems offer very little reduction in cooling energy. The additional fan power energy (parasitic losses) generally make evaporative cooling more energy intensive than the baseline condition. while indirect/direct evaporative cooling enables further savings in cooling energy. However, the additional fan power is detrimental to the overall performance. Finally, Las Vegas – a desert-like climate – demonstrates substantial savings in cooling energy, with an indirect/direct evaporative solution offering as much as a 79% saving over the baseline. There are some standard assumptions embedded in the analysis above, including the depth of wetted media (200mm) and configuration of the components within the air handling units. Both are variables that can be configured to optimise the system performance. For example, increasing the depth of the wetted media will increase the saturation efficiency and, therefore, the evaporative cooling effect. However, with increased media depth comes increased pressure drop, resulting in higher fan energy. The depth of the wetted media should be studied on a case-by-case basis to optimise for overall energy performance. Another consideration is the location of the supply fan(s) relative to the evaporative media. A blow-through fan configuration gives sensible fan heat upstream of the evaporative media, increasing the wet-bulb depression ahead of the evaporative cooling process. This improves the performance when compared to a draw-through fan configuration, where sensible fan heat is added downstream of the evaporative media. Additionally, the use of a bypass damper should be considered for the evaporative media. Not only does this reduce fan energy when the evaporative cooling section is inactive, but it also provides some controllability of the air temperature downstream of the evaporative media, which can be subject to over-cooling. On a final note, it behoves engineers to consider the water consumption for any evaporative cooling solutions. The suggestion that evaporative cooling could save water as well as energy might sound contradictory, until you look beyond the building level and consider the water-energy nexus. In the case of Las Vegas, the state of Nevada gets most of its electricity generation from hydro-electric power – think Hoover Dam. The evaporation losses from hydro-power and, to a lesser degree, fossil-fuel power plants, are such that every kWh of energy consumed in Nevada uses 27 litres of water at the source. So, in the case in Las Vegas, the direct evaporative cooling solution consumes an estimated 1.2 million litres/year in site water, but saves approximately 1.45 million litres/year of source water tied to a reduction in electricity consumption. The above is an extreme case – and in many other examples of evaporative cooling there will probably be an increase in water consumption – but it draws attention to the importance of looking beyond the site metrics in any study.